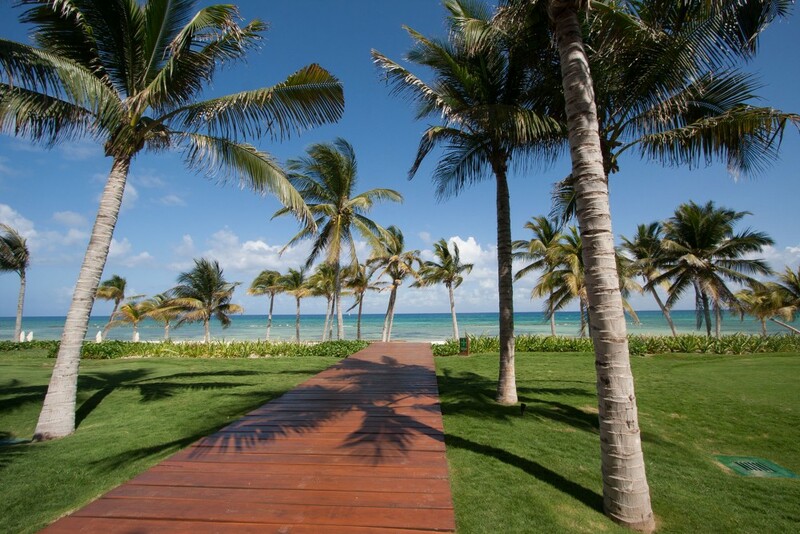 Indulgent and relaxing boutique hotel, set on one of the area’s best beaches. Heavenly for honeymooners, spa aficionados and also for families looking for privacy and outstanding service. 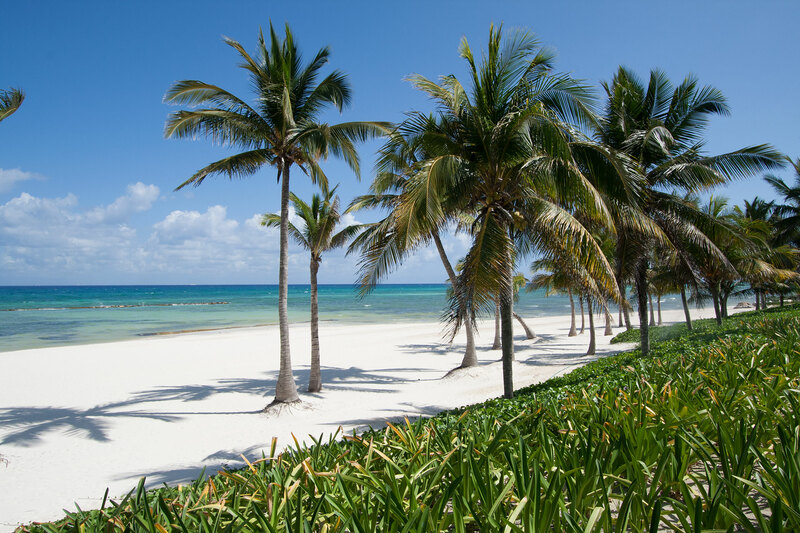 The Grand Velas Riviera Maya is without doubt one of the most elegant and luxurious resorts along the Riviera Maya and offers the ultimate all-inclusive experience. Lavish, spacious suites feature indulgences such as opulent marble bathrooms with Jacuzzi bathtub and a complimentary mini-bar that is replenished daily with your favorite drinks. The Grand Class Suites in the ocean front, adults-only section are spectacular. The property is divided into three distinct sections that each offer a different experience. 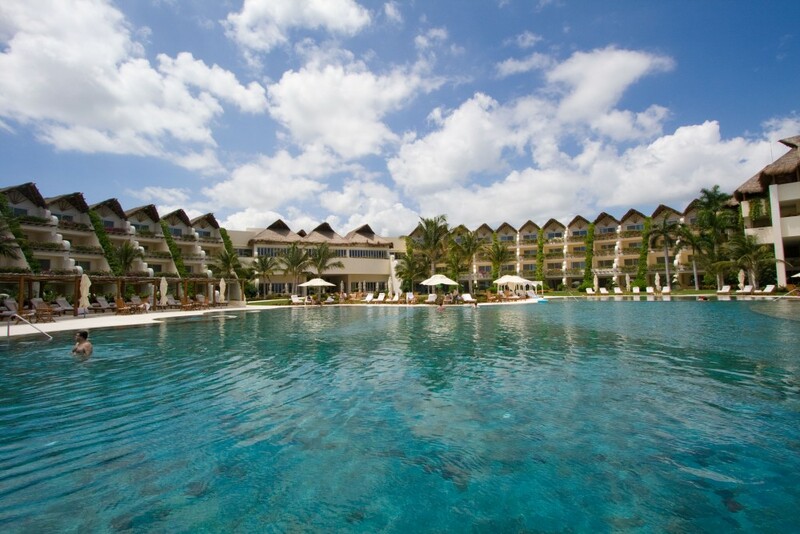 The Zen Grand section is set in lush tropical forest and has a calm relaxing atmosphere. 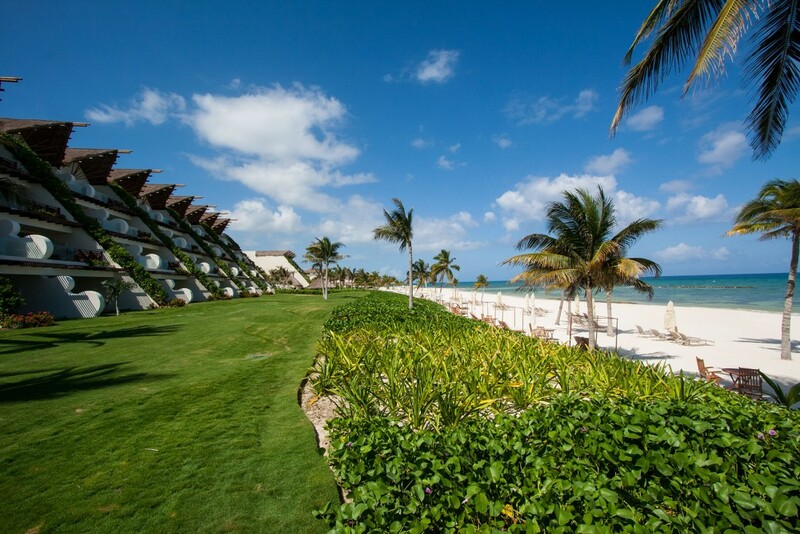 The Ambassador section is located right by the beach area and is a perfect choice for families. 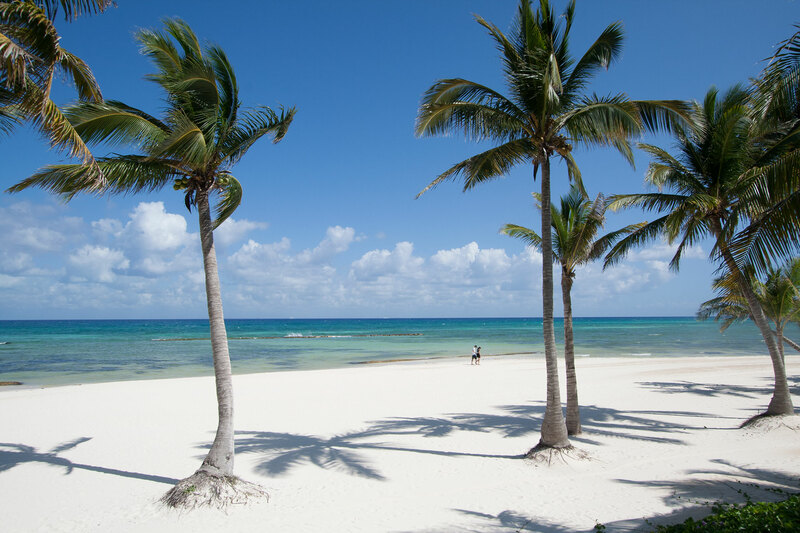 The Grand Class section also enjoys a beachfront setting but this area only permits only adults and older children and has a more romantic and sophisticated ambiance that is perfect for couples and honeymooners. The resort has fabulous facilities that include swimming pools, fitness room, water activities, spa, kids’ club and daily activities. One of the highlights of a stay at the Grand Velas is the gourmet cuisine. There are eight restaurants to choose from offering a fantastic range of culinary styles and dining experiences. From the daytime casual style of Azul, Bistro and Chaca to the evening splendor of Piaf, Frida and Cocina de Autor, the food is some of best you’ll experience. The Grand Velas is located on a wonderful long sandy beach edged by the crystal turquoise waters of the Caribbean. There are plenty of loungers and shaded daybeds for relaxation. 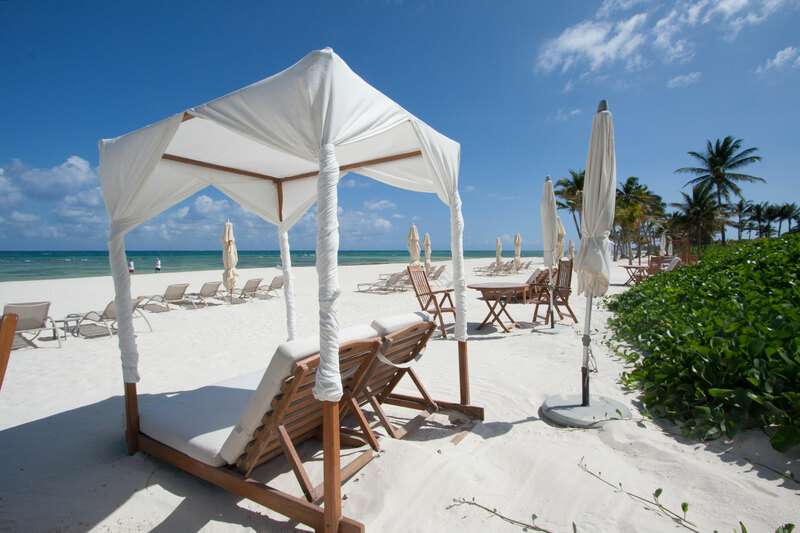 An attentive staff will take care of your every need from bringing cool towels, to exotic cocktails, to even serving a delicious lunch right on the beach. 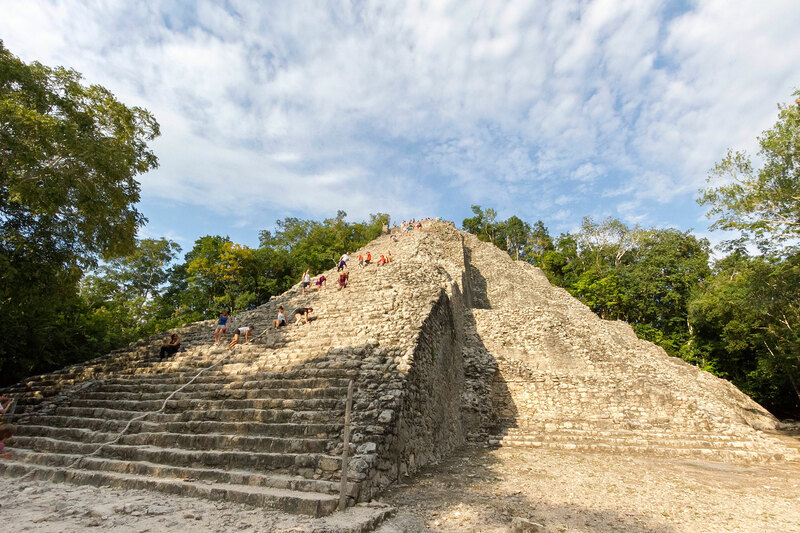 Located approximately 40 minutes south of Cancun Airport and just 10 minutes north of Playa del Carmen, the hotel is well placed for exploring the many treasures of this area including the archaeological sites of Tulum and Chichen Itza. 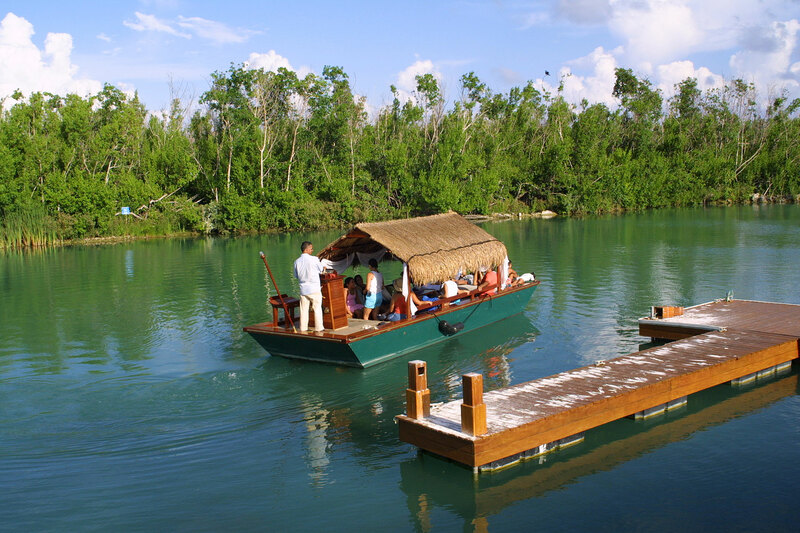 A wide range of excursions and activities can be arranged through the hotel. 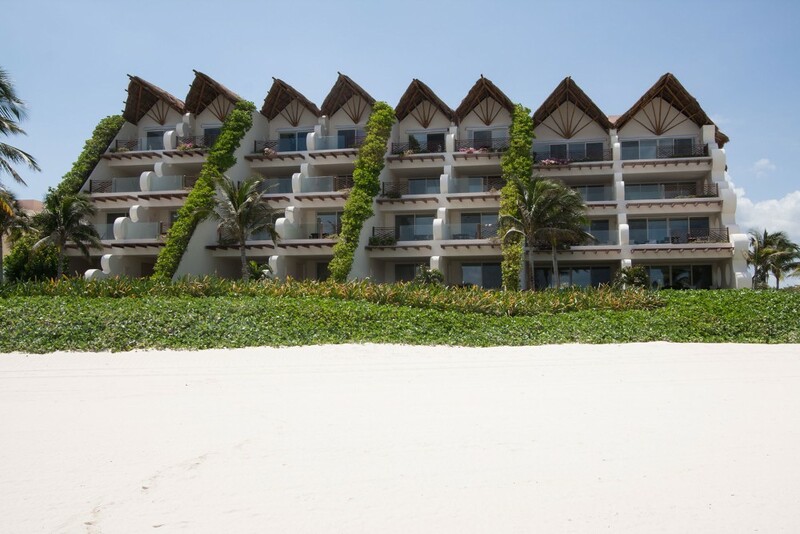 The Grand Velas offers luxurious all-suite accommodation. Although the suites don’t have a separate living room and bedroom they have lots of floor space with an open-plan sitting and bedroom area. The rooms are sumptuously furnished and feature lots of hi-tech amenities, including flat-screen TVs, in-room wireless Internet access and Jacuzzi bathtubs. Suites have either one king bed or two queen beds and can sleep up to three adults, or two adults and two children. 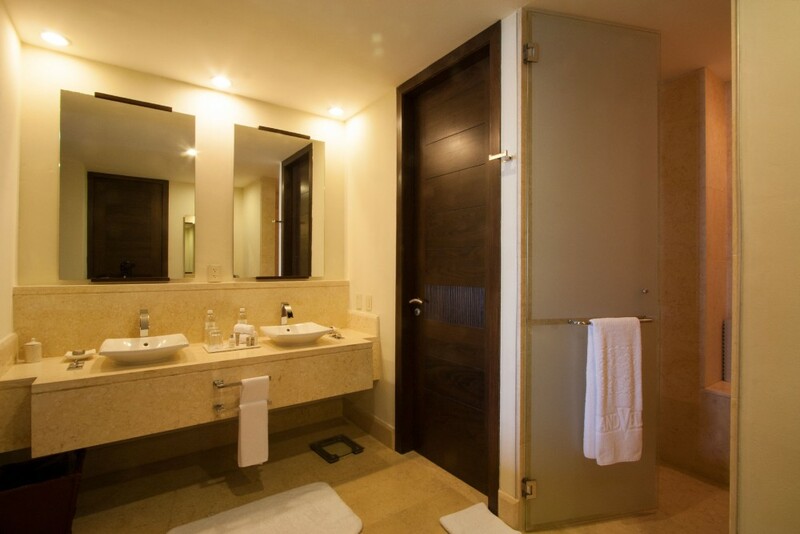 The rooms have stunning marble bathrooms with wide double doors that open out on to the bedroom. Each featuers a double vanity, tub and separate walk in shower. There is a supply of Molton Brown toiletries and soft cotton dressing gowns. 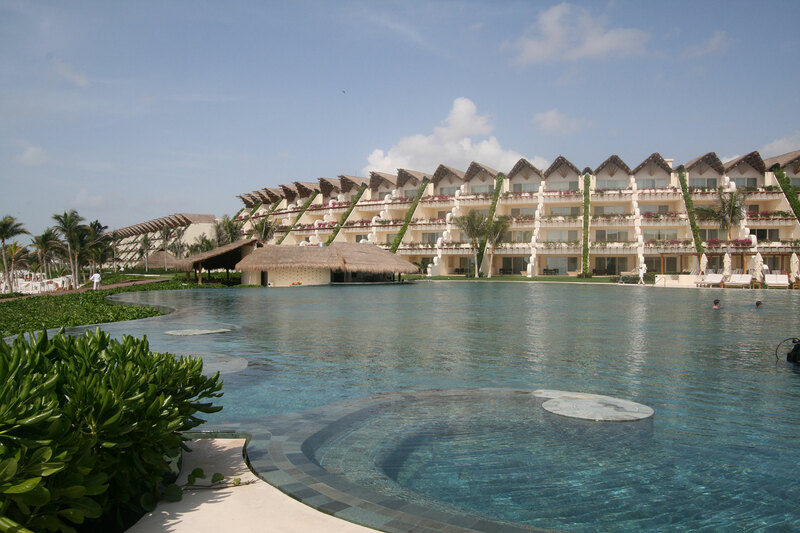 The rooms are arranged through the three distinct sections of the hotel, Zen Grand, Ambassador and Grand Class areas. The suites in the Zen Grand section enjoy views of the jungle and fresh water rivers, with a relaxed, tranquil atmosphere. This area is set away from the beach, with and a shuttle is provided between the two. Ambassador section is right by the beach; its huge beachfront swimming pool make this a perfect choice for families. The Grand Class section is also beachfront. This section only takes older kids; it has a more sophisticated ambiance and the interiors are spacious and inviting, with many extra features. Guests, of course, can choose to eat at any of the restaurants or use any of the facilities in other sections; the only exception is that no children under the age of 12 years can use the facilities or restaurants in the Grand Class Section. Wireless internet access, air-conditioning, 42″ plasma TV, room safe, 24 hour room service hairdryer. One king or two queen beds, interior Jacuzzi, over 1100 square feet, located 0.75 miles from the beach with complimentary shuttle available day and night, (206 suites). 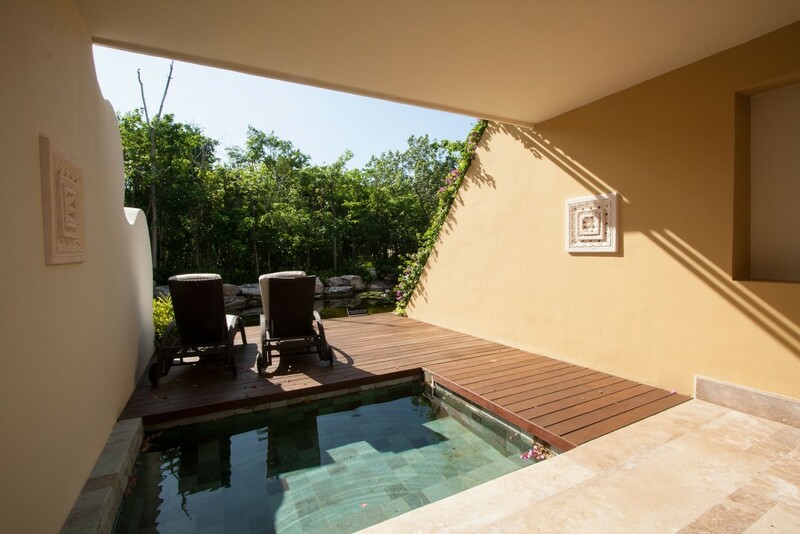 Adults only, private plunge pool and indoor jacuzzi, ocean view, DVD/CD/MP3 player (90 suites). 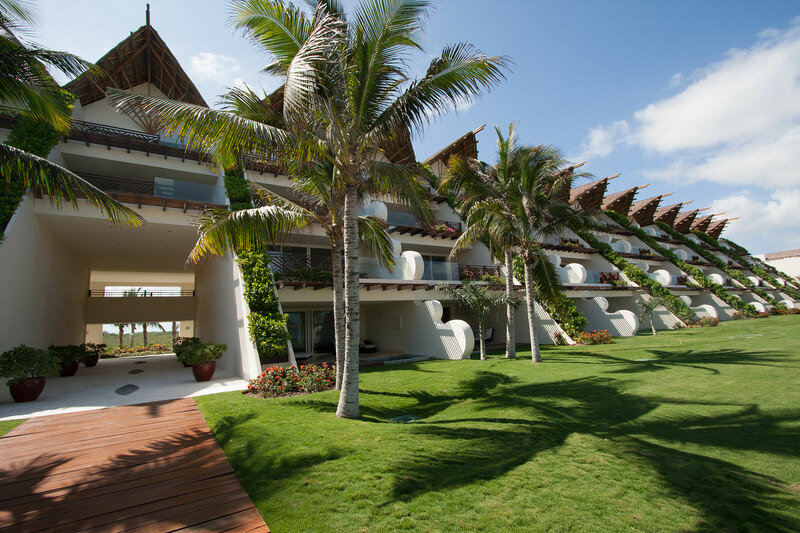 The Zen Grand Suites are located away from the beach and enjoy a peaceful, relaxed and natural setting surrounded by a tropical forest and fresh water rivers. 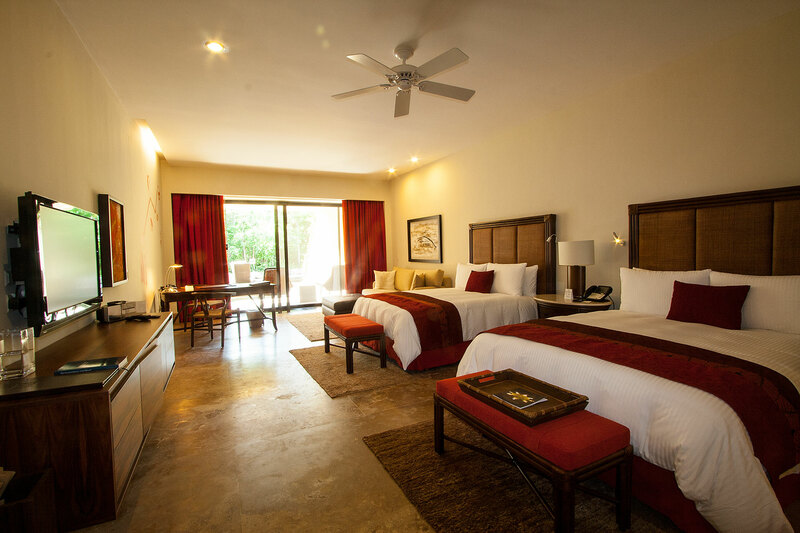 The suites have one king or two queen beds and can very comfortably accommodate a family of four. They offer lots of space and are stylish with contemporary Mexican decor and furnishings. All the rooms have flat-screen TV, DVD and MP3 Players, mini bar, coffee maker. iron and ironing board and Jacuzzi bathtub. 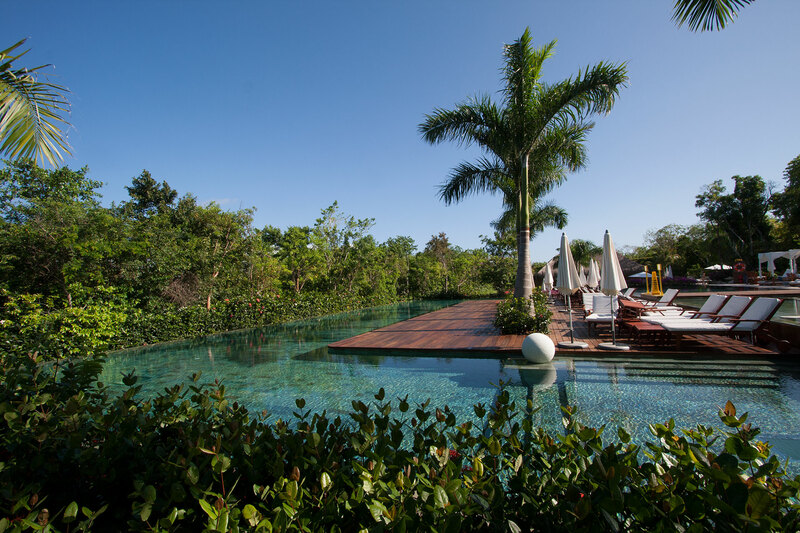 The 36 Zen Grand Pool Suites have a large furnished terrace or balcony looking out on to the jungle and rivers, and private outdoor plunge pools. Beds have luxurious goose down comforters and pillows and high thread count bed linens. There is a sitting area with comfortable easy chairs or sofas where guests can relax and watch TV (including pay-per-view movies) or listen to music. 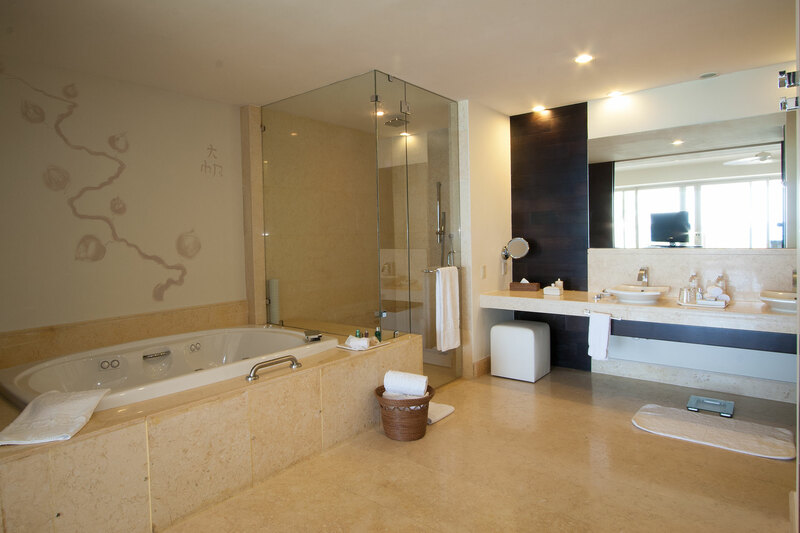 Large marble bathrooms have double vanity, oversized walk-in shower, Jacuzzi bathtub and dressing area. 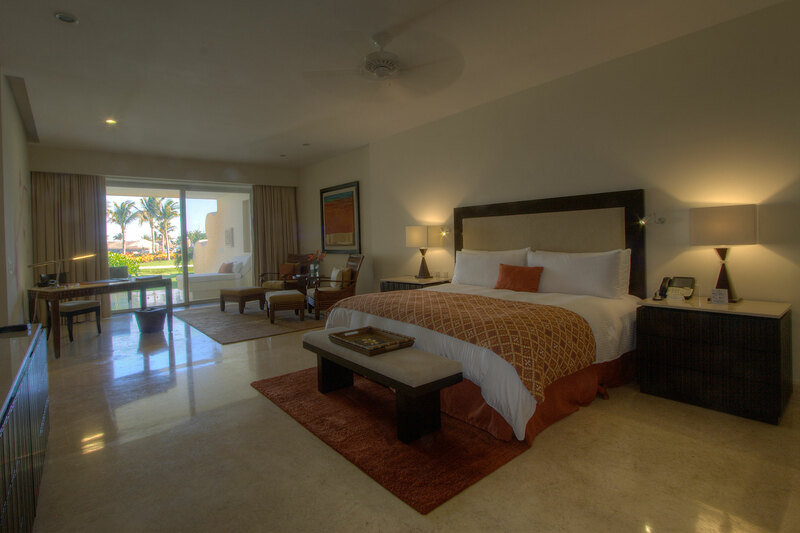 The Ambassador Suites are slightly larger than the Zen Grand Suites and are located right by the beach. These opulently furnished suites have either a king or two double beds and have a open plan sitting area with chairs or sofa and a desk. 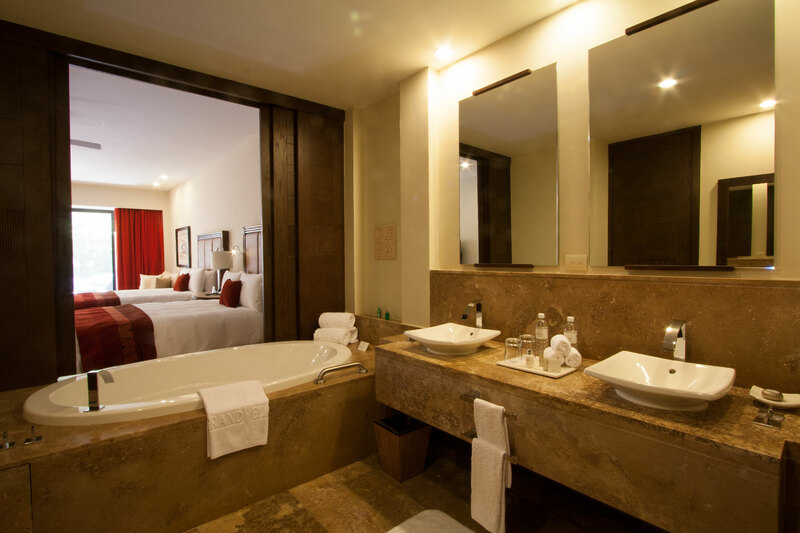 The rooms have cool cream stone floors and spacious marble bathrooms with Jacuzzi bathtub and separate walk in shower. 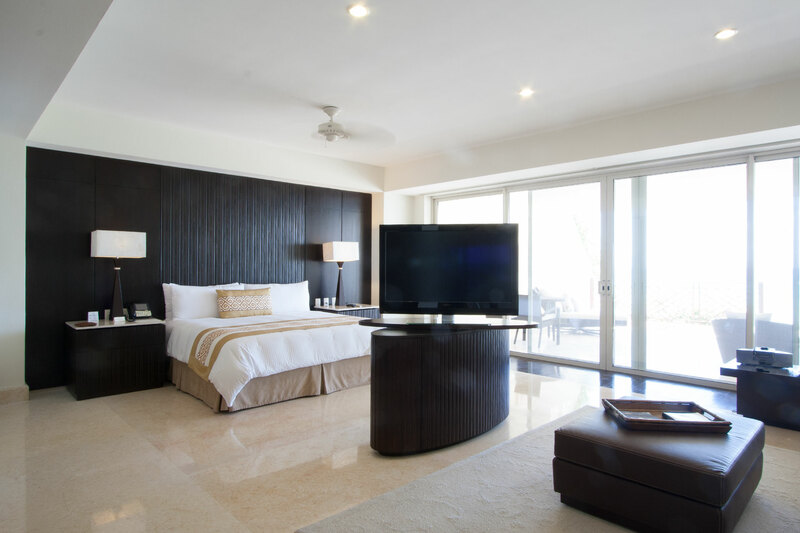 These sumptuous rooms also feature flat-screen TV, DVD and MP3 player, air-conditioning, ceiling fans, coffee maker, daily replenished mini bar and iron and ironing board. 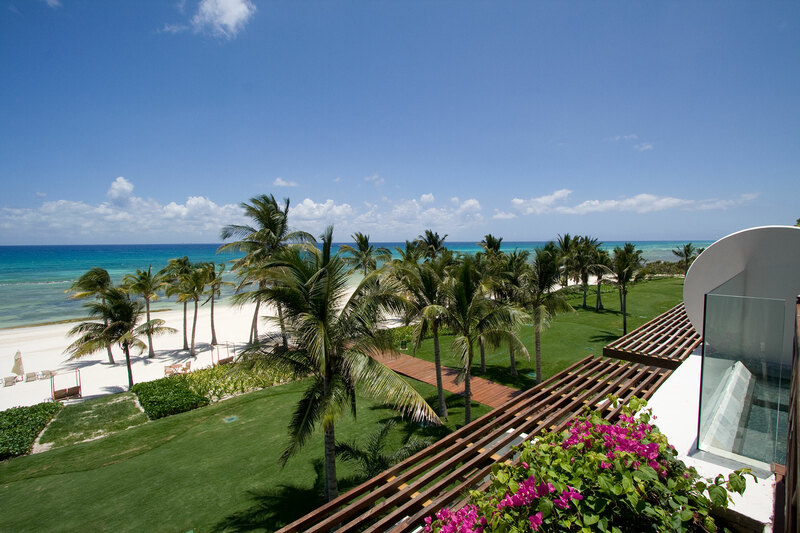 Each suite has a large terrace or balcony with views of over the pool and ocean beyond. 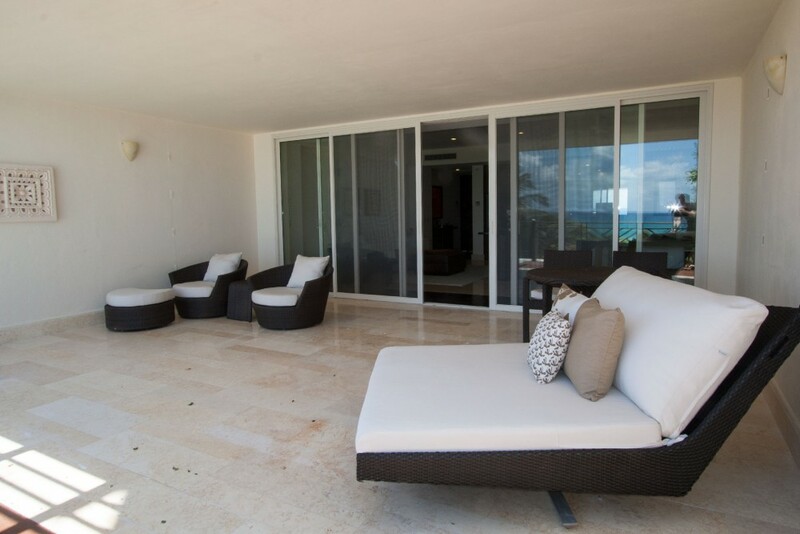 There is a daybed for afternoon siestas and table and chairs for in suite dining. 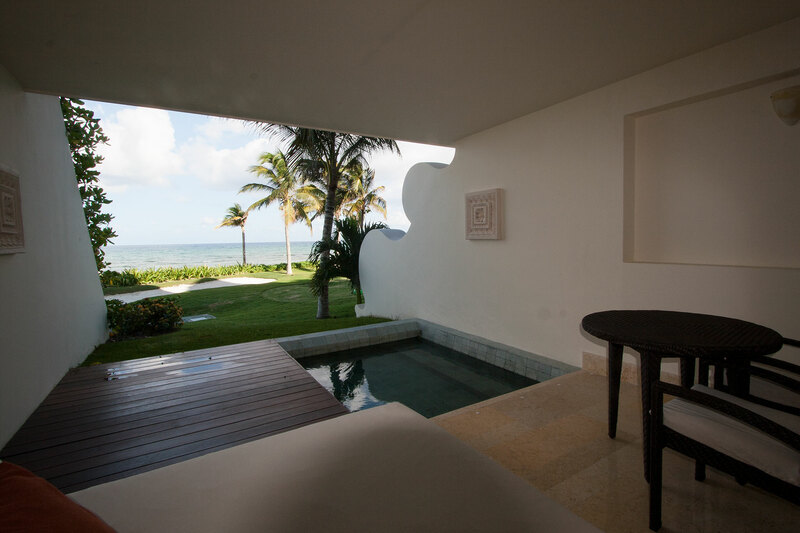 The nineteen Pool suites are located right by the edge of the beach with direct ocean views and a plunge pool on their terrace. These suites are ideal for families with young children because of their proximity to the beach and swimming pool. Ambassador pool suites are ocean front and have a private plunge pool on their terrace or balcony. The Grand Class Suites are the largest and most luxurious of the rooms at the resort. They are located in a low-rise block right by the edge of the beach. 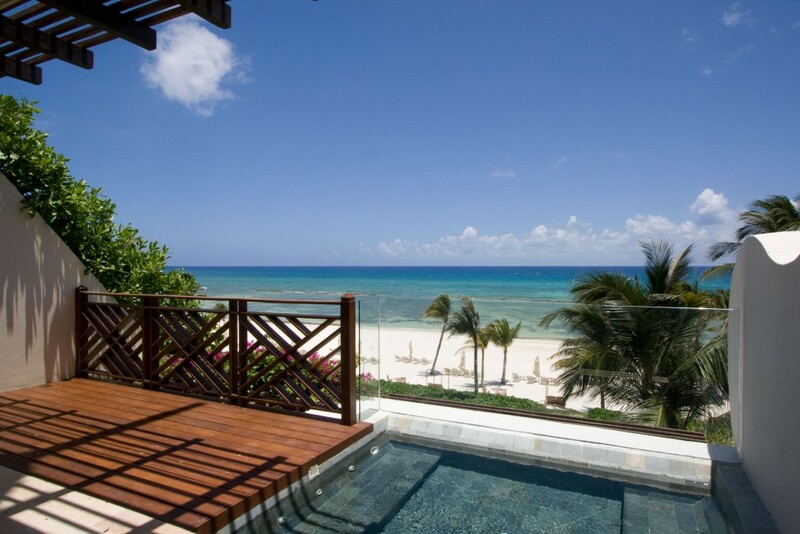 All of the suites have fabulous ocean views and all have large terraces or balconies with private plunge pool. Children over the age of 12 years are accepted in the upper floor suites when sharing a room with their parents. This section of the hotel is smaller than the Zen Grand and Ambassador sections and has a more private and intimate ambiance. The suites have the same luxurious fixtures and decor as the Master and Ambassador Suites but on a slightly grander scale. They feature one king or two queen beds and large open-plan sitting area that is separated from the bedroom area by a large flat-screen TV that swivels, so can be watched from the sitting room or bed. Large sliding doors lead to the impressive marble bathroom with double vanity, Jacuzzi bathtub and rain shower. The doors can be closed for privacy, or left open to merge the bathroom and dressing area with the living space, creating a huge open plan suite that faces the Caribbean. One of the highlights of a stay at the Grand Velas is the quality and variety of the food. 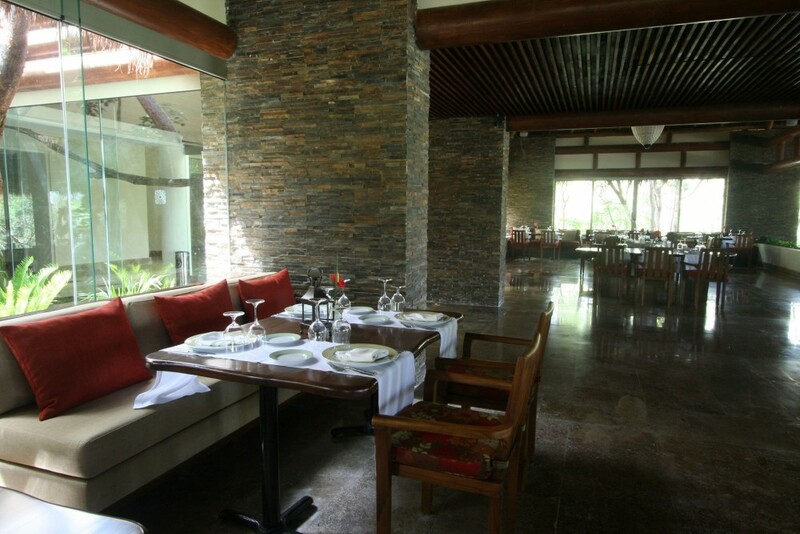 Each section has an all day restaurant which is available for breakfast, lunch and dinner. Chaka in the Zen Grand section, Azul in the Ambassador section and Bistro in the Grand Class Section are open throughout the day for meals and snacks. They have extensive buffets offering an amazing selection of fresh dishes. 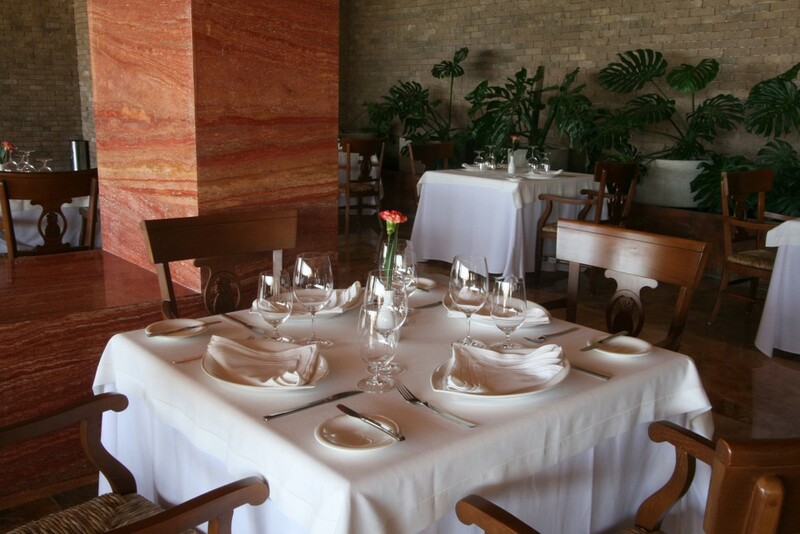 In the evenings guests can also choose from one of the five a la carte restaurants. The service and presentation in each is impeccable. With a choice of Italian, Mexican, French and Asian cuisine; there really is something for everyone. In addition to the restaurants there is also 24-hour room service available offering everything from snacks to gourmet meals. The restaurants in the Zen Grand and Ambassador Sections also have a children’s menu which has more familiar dishes for younger guests. There are also a variety of bars available, from the romantic Sky bar with its outdoor terrace facing the ocean, to the elegant lobby bars and the more casual Karaoke bar. Frida is located in the Ambassador section and serves wonderful Mexican dishes. The restaurant opens for dinner from 6:00 pm to 11:00 pm and the dress code is smart casual. 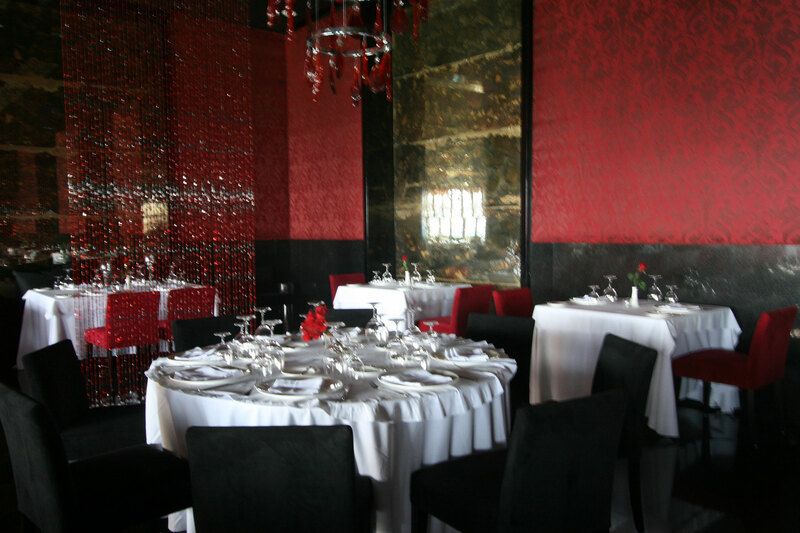 Frida has stylish uncluttered interior with marble floors, walls and white linens. Dinner starts with the margarita bar; the waiter offers a range of fresh fruit margaritas made from your choice of top brand tequilas. There is a wonderful choice of Mexican dishes with a contemporary twist. We chose from Honey Tamarind Duck Confit served with its flavored Corn Tortilla and a selection of special sauces, Sea Bass in Yellow Molé Sauce served with Cilantro Rice and Baby String Beans and De la Costa Style Enchiladas filled with sautéed Lobster bathed in an Almond Pipian Sauce. There is also a children’s menu with simpler dishes. Piaf is located in the Grand Suite Section and only accepts children age 12 years and over. The restaurant opens from 6:00 pm to 11:00 pm each evening for dinner. Dress is smart casual, no flipflops, shorts or t-shirts. The interior is lavishly decorated with an almost theatrical feel. Rich reds and silver contrast with white table linens. There is indoor air-conditioned seating with views over the sea and an outdoor terrace to make the most of the cooling ocean breezes. Diners can enjoy an aperitif in the Sky Bar. Piaf serves exquisite French cuisine in gracious surroundings. Sample menu options include: classic French onion soup with Gruyere cheese, Lobster Veloute in cognac, jumbo shrimps and lion claw scallops marinated with saffron over Mediterranean couscous, mussel sauce and tarragon rucula, roasted rack of French lamb in antique mustard and Provence herbs. Azul is the all-day restaurant in the Ambassador Section. This is a wonderfully light and airy dining space with large windows facing the beach and ocean. It is open from 7:00 am to 11:00 pm daily. There is both air-conditioned indoor seating and outdoor seating for al fresco dining. Azul is perfect for families with children and the hotel offers a special children’s menu which includes pizza, hamburgers and pasta. Azul offers a wide selection of Mexican and International specialities which are all beautifully presented using the freshest of ingredients. Breakfast has something for everyone. A cold buffet of fresh fruits, juices, cereals, yoghurt, pastries and bagels. There are also a wide variety of hot dishes, eggs cooked any style, Chilaquiles and Tamales. 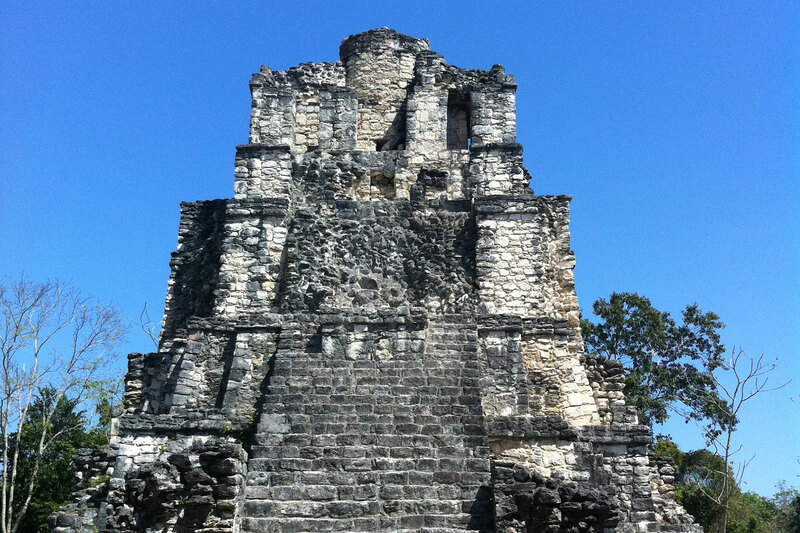 Lunch and dinner include some traditional Mexican dishes such as tacos and burritos. You’ll also find some great fish dishes, including excellent cerviche and tepanyakis. Diners can also enjoy a wide range of hamburgers, meats and fish fresh from the grill. 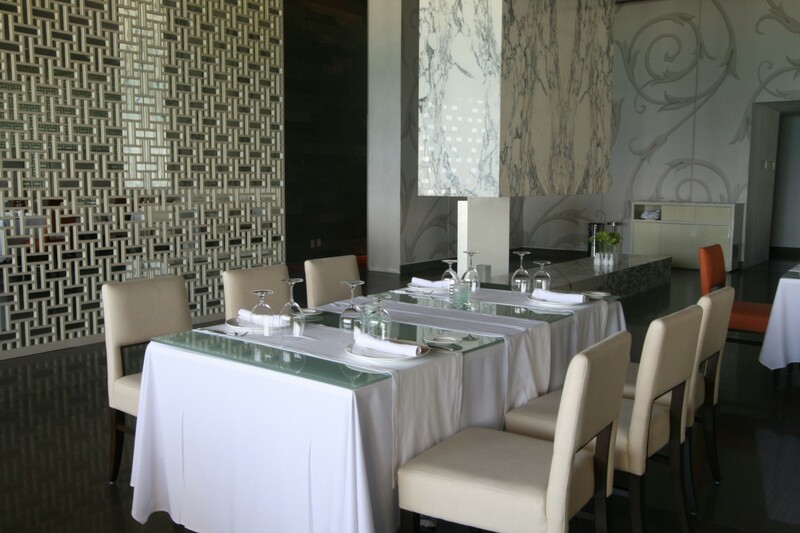 Cocina de autor is the signature restaurant at Grand Velas. Located in the Grand Suite section it is for adults only and has a sophisticated atmosphere. The restaurant is located by the beach and has wonderful ocean views. There is both indoor seating and tables laid out on an open-air terrace. The restaurant opens for dinner from 6:00 pm. Chefs Bruno Oteiza and Mikel Alonso create fabulous haut cuisine Spanish delights along with Mexican specialties. The tasting menu provides an excellent introduction to the gastronomic pleasures on offer. During our visit the a la carte menu included Foie Gras Terrine with Muesli and Bougainvillaea Flower, Piquillo Pimentos stuffed with Duck and Tamarind, Grilled Lobster with Black Corn and Slightly sweet and sour Lamb with a Crunchy Shell. Guests also have the choice of further restaurants at the Grand Velas Riviera Maya. Chaka is the all day restaurant in the Zen Grand Section this is open for breakfast, lunch and dinner. It is surrounded by tropical forest. The restaurant is casual, offering healthy organic dishes. There is a kids menu available. Lucca serves Italian-Mediterranean cuisine in comfortable air-conditioned surroundings. Dishes include pastas, risottos, pizza and grilled meats. Sen Lin is located in the Zen Grand section and specializes in Asian cuisine. Dishes from China, Japan, Thailand and Vietnam are available and there is a tasting menu for a good introduction to the style and flavors. Seating is in comfortable air-conditioned surroundings. 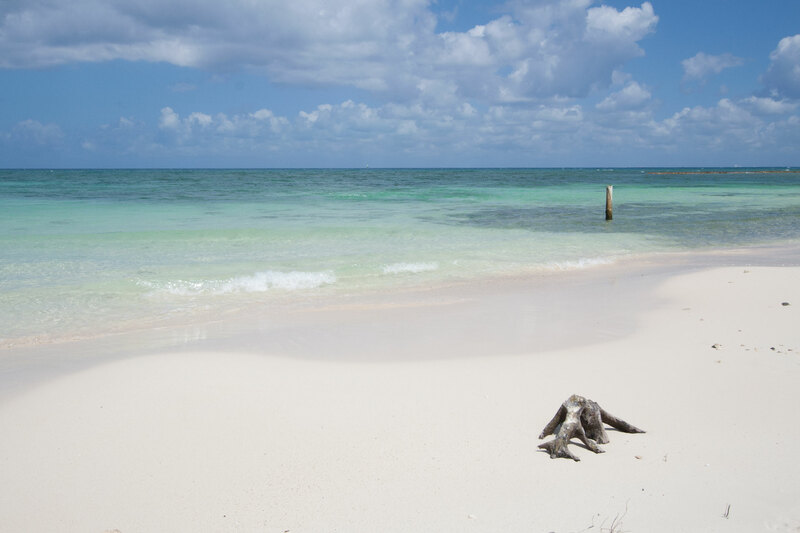 This is a wonderfully long stretch of soft white sand. There are plenty of sun beds, palapas and shady salas for guests to relax on. There is always staff on hand to take care of your every need; from bringing fresh towels and cooling drinks to serving lunch at your table right on the beach. 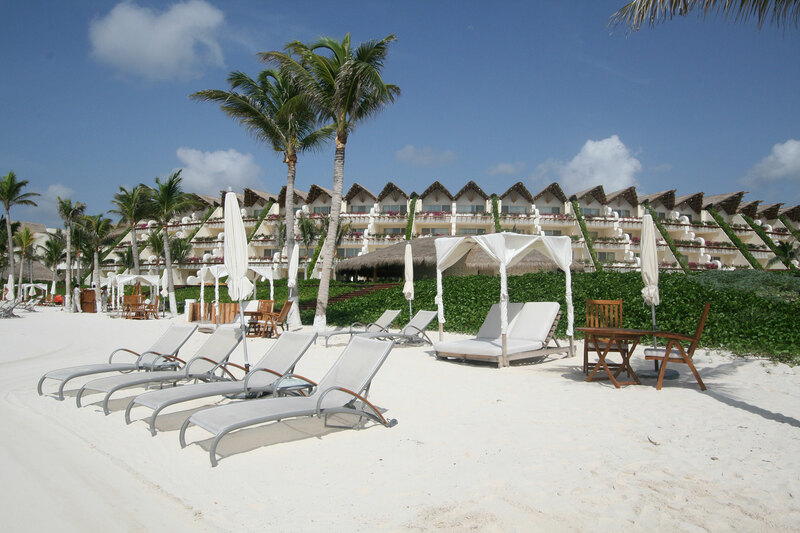 Although the hotel is fairly large, the beach never feels busy or crowded. 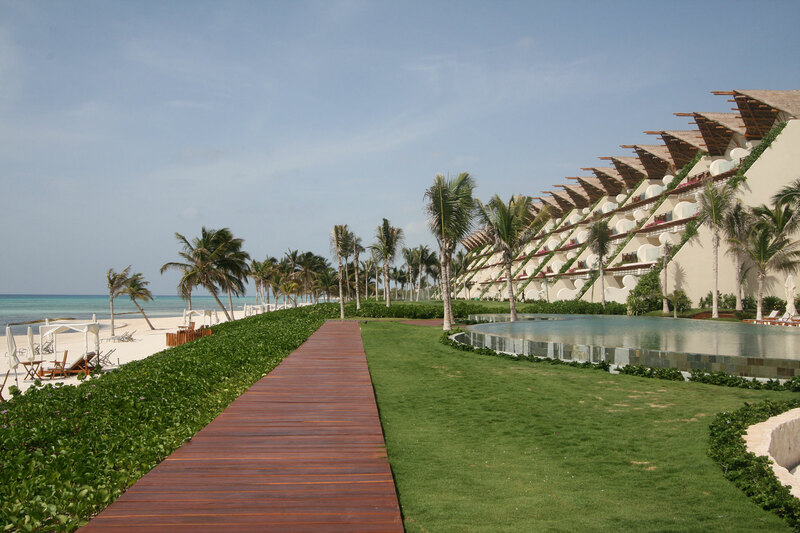 The Grand Velas is just north of Xcalacoco Beach and close to Mayakoba. We like walking in the shallows here to explore this little stretch of coastline. 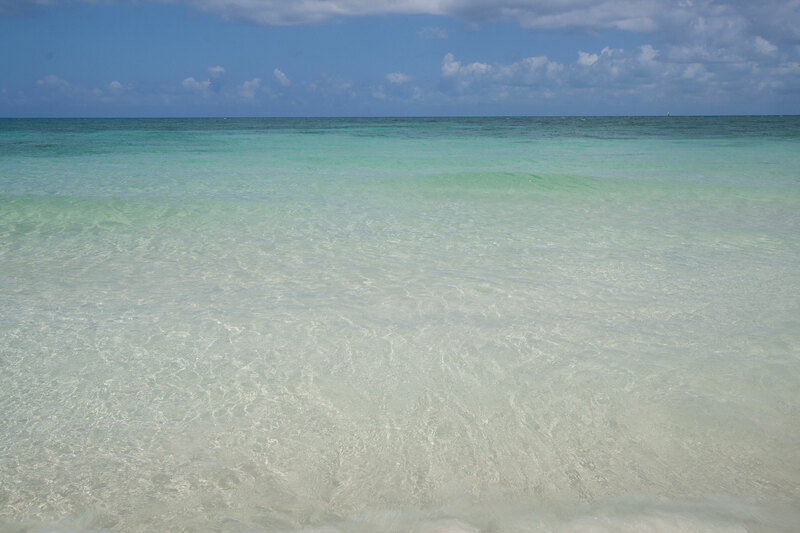 The beautiful turquoise waters of the Caribbean are just steps away. The water here shelves gently and is protected by a sea wall which means the water is calm and perfect for children to play safely. There are a wide range of water activities available including kayaks, hobbycats, boogie boards and snorkeling equipment. 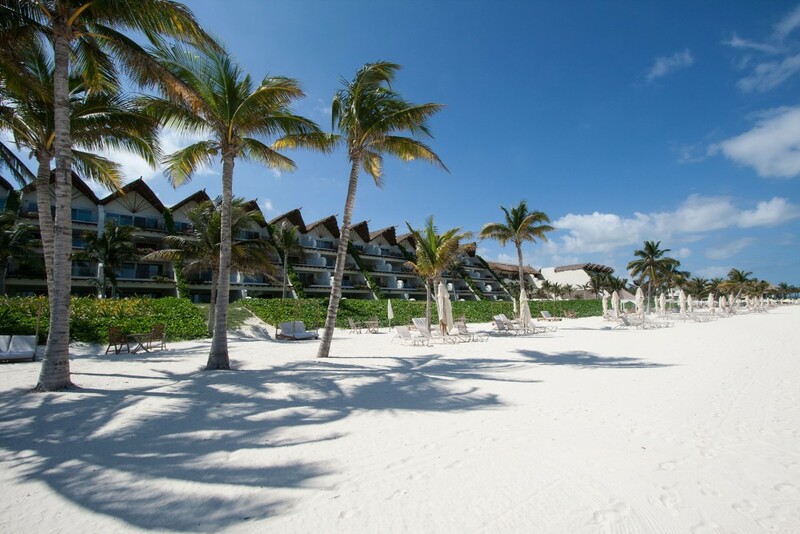 Grand Velas Riviera Maya boasts an impressive spa and comprehensive fitness room. The fitness room has a range of cardio vascular equipment, treadmills, crosstrainers and cycles as well as weight machines and free weights. There is a fitness instructor available to provide individual fitness programs. There are also daily yoga and pilates classes. There is a daily schedule for the classes but they are flexible and can adjust sessions to meet the attendees’ ability level. 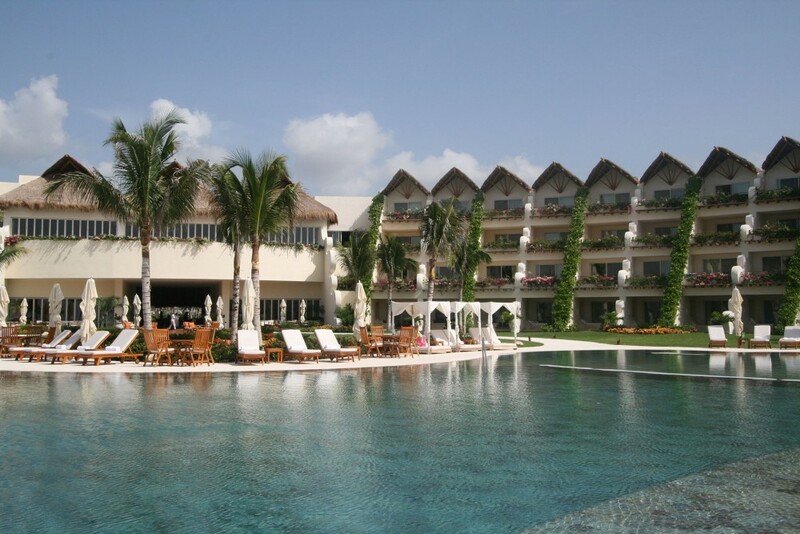 There are three wonderful swimming pools to choose from at the Grand Velas; one located in each section. They all have very different ambiances: you’re sure to find your own personal favourite. Whichever pool you choose you’ll find the same impeccable service from attentive staff. Drinks are always available and lunch can be served poolside and guests can choose from simple snacks to gourmet meals. 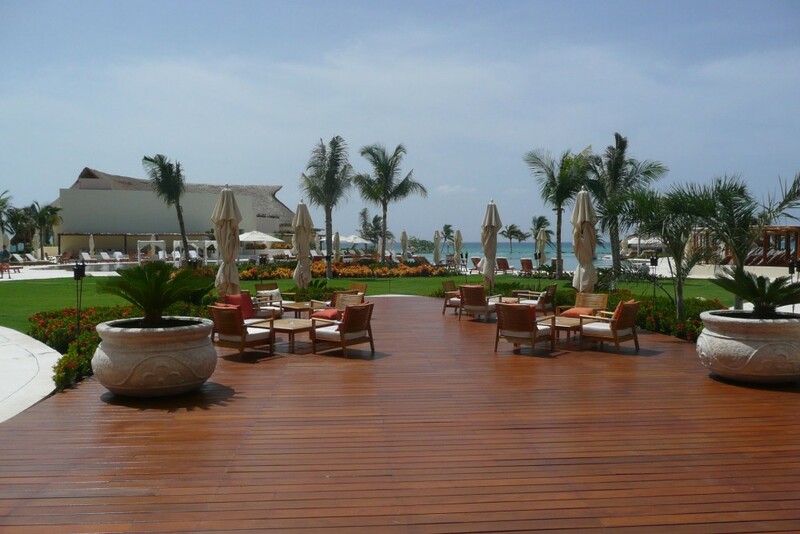 All of the swimming pools have swim up bars, parasols, sun beds and tables and chairs for al fresco dining. The Zen Grand is set in jungle and has a very tranquil and tropical feel. The Ambassador pool is located beachfront and is larger and has more of a family appeal. The romantic infinity pool in the Grand Suite section is quieter and has definitely been designed with couples in mind. Children under the age of 12 are not permitted in the Grand Class pool. 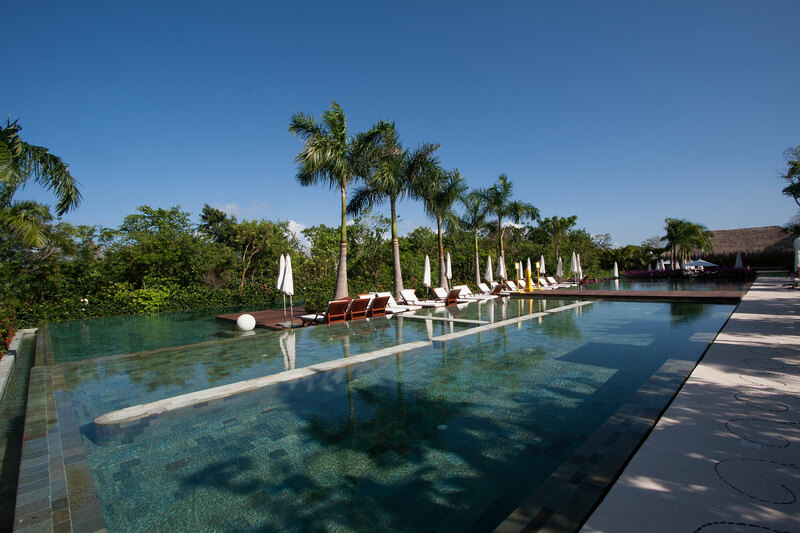 The pool in the Zen Grand section is possibly the most visually stunning of all the three pools, with green hues that blend well with the lush jungle surroundings. It has a very relaxed and peaceful atmosphere. 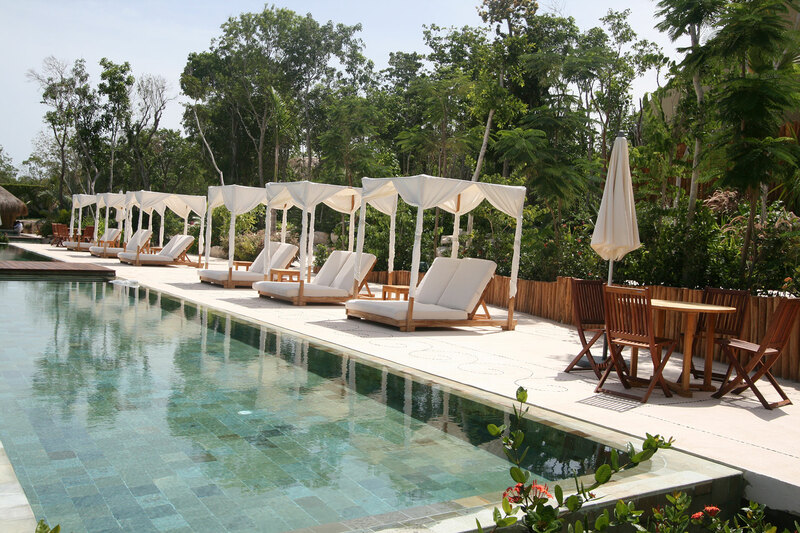 The pool is divided into several long sections which makes it ideal for laps. A decked area surrounds the pool with plenty of sun beds, parasols and tables and chairs for those that want to lunch here. 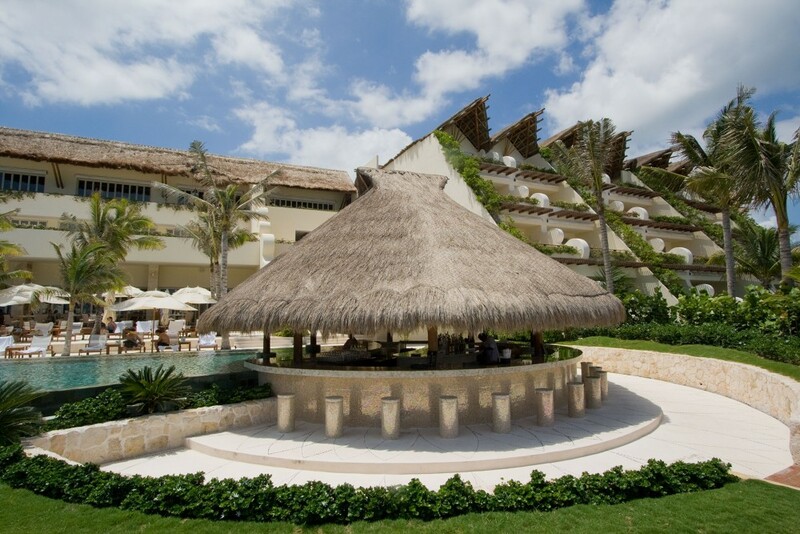 There is a swim up bar under a large palapa to one end of the pool and waiters to bring drinks and serve food to those who don’t want to leave the comfort of their sun bed. The pool in the Ambassador section is one of the center pieces of the hotel. 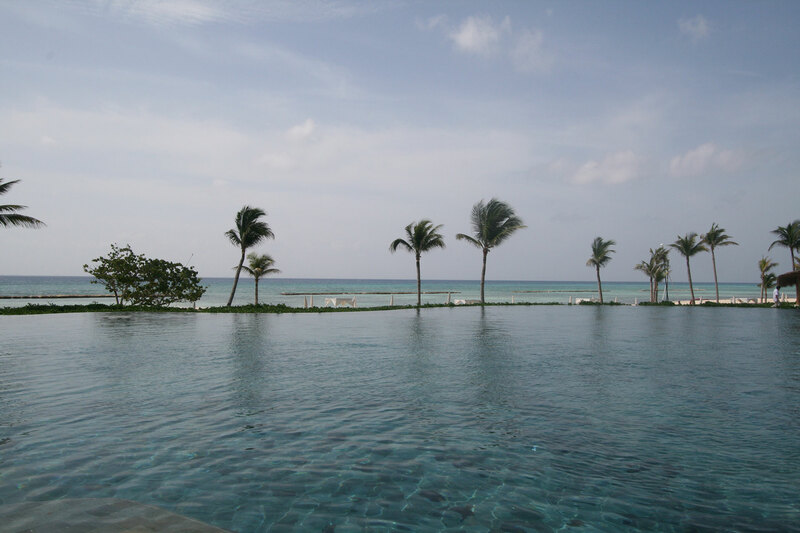 This huge freeform pool is located right by the edge of the beach and swimmers can enjoy wonderful views of the turquoise Caribbean. It is surrounded by the Ambassador Suites with their colorful terraces cascading with bougainvillea. There are plenty of sunbeds, shades and salas. Attentive wait staff are on hand to take care of your every need. Adults and older children can enjoy a complimentary introduction to scuba in the pool, and there are plenty of inflatables for kids to play with. The pool is right by Azul restaurant and beach, so you don’t have far to wander to lunch or to the sea if you want to try kayaking or sailing; non-motorized water activities are all included in the daily rates. The Grand Class section of the resort boasts a beautiful infinity-edged swimming pool that is right at the edge of the beach with fabulous views of the Caribbean. This pool is smaller and has a more intimate and romantic ambiance than those in the Ambassador and Zen Grand sections. Young children are not allowed in this area. The pool has a swim up bar under a large palapa, and drinks and snacks are served around the pool. 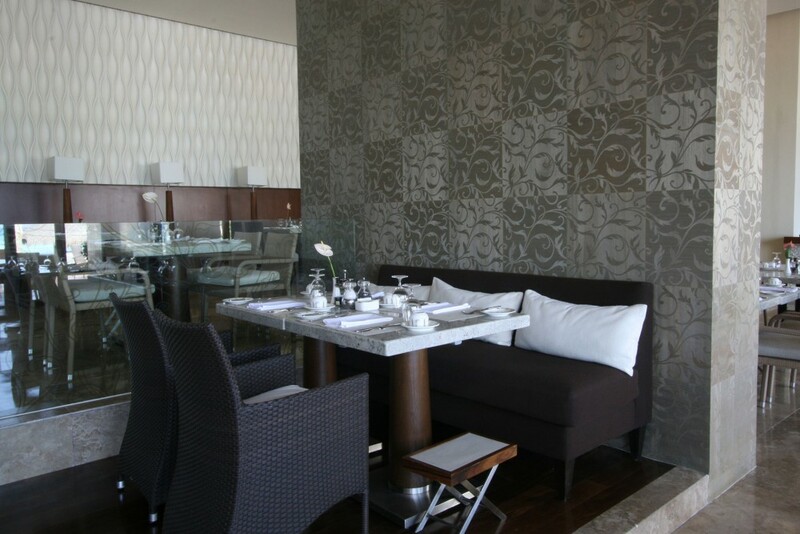 It is located close to Bistro, the all day restaurant for those who prefer to lunch in air-conditioned surroundings. The nearest airport is Cancun – by road the journey to the Grand Velas Riviera Maya takes about an hour. From Cancun Airport take the highway #307 towards Playa del Carmen and Tulum. This is a two lane modern highway. The road will take you past Puerto Morelos and the entrance for Mayakoba which will be on left hand-side. 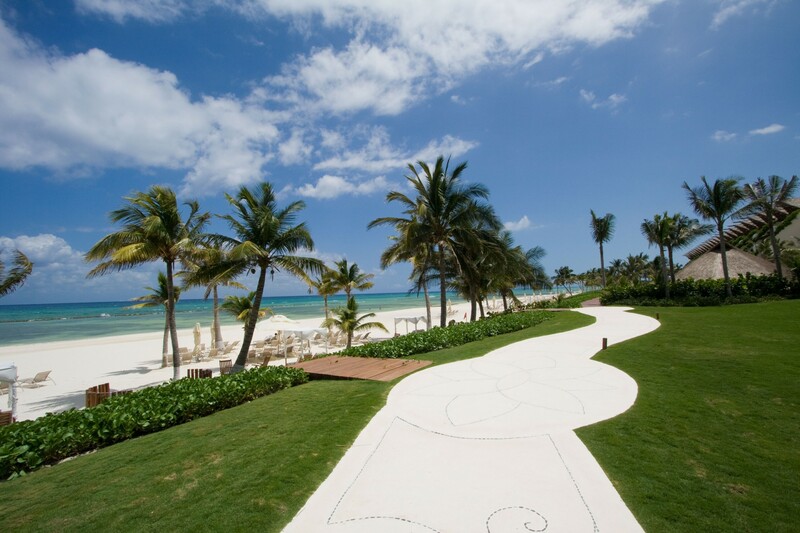 Approximately half a mile further down the road you will see the entrance to the Grand Velas Riviera Maya. The huge impressive entrance cannot be missed with its pale blue frontage and lake in front.